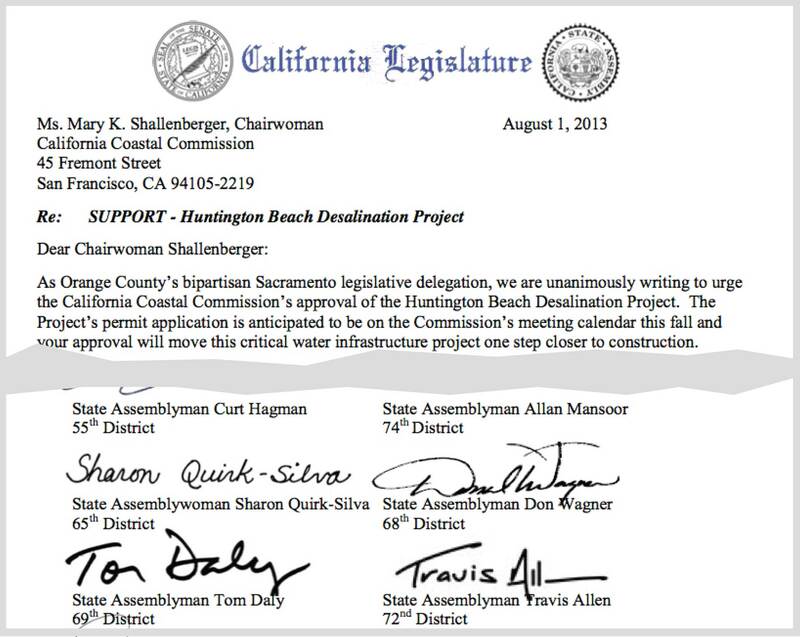 In a stunning rebuke to her environmentally minded supporters, Assemblywoman Sharon Quirk-Silva has signed a letter of support to the California Coastal Commission on behalf of Poseidon Water’s plans for a desalination plant in Huntington Beach. The proposed plant has provoked fierce opposition from, among others, the Sierra Club, who endorsed Ms. Quirk-Silva’s successful campaign to unseat incumbant Chris Norby in the 65th Assembly District. Mr. Norby was also in support of the project. The proposed plant would be built at the intersection of Newland and Pacific Coast Highway in Huntington Beach, where a majority of Huntington Beach’s city council also opposes it. “The proposed Poseidon Huntington Beach Desalination Facility should not be awarded a Coastal Development Permit. The project would kill fish and plankton by sucking them through an open ocean intake. Operations at the plant would release hyper-saline brine and cleaning fluids that degrades water quality and harms marine life. The facility would contribute to climate change and sea level rise. Desalinated water is more expensive than existing water supplies. Ms. Quirk-Silva’s support for Poseidon’s proposed desalination facility is hardly consistent with her claim to protect our environment. Sierra Club members and anyone else concerned about the natural environment–and their water rates–should be very disturbed that she has taken a position of support for a project that would not only harm marine life, but would be operated by an aging, polluting power plant located next to it. Ratepayers in Fullerton would not directly benefit from the desalination plant, but that didn’t stop Poseidon from soliciting the city’s support. In 2010 Sharon Quirk-Silva herself opposed a resolution of support for Poseidon’s plans while a member of the Fullerton City Council. In January of this year Fullerton’s water-systems engineer David Schickling explained to the OC Weekly that Fullerton had been a part of a desalination working group, but left it when it became clear that the city would only receive a subsidy from the Metropolitan Water District instead of desalinated water. Assemblywoman Sharon Quirk-Silva should immediately rescind her support for this unsustainable, expensive, and exclusionary project that will not provide a long term solution to Fullerton’s water needs, or anyone else’s. The $ 1 million settlement obliquely described as “another liability case” is presumably the payout to Cathy Thomas, whose son Kelly was beaten to death by officers of the Fullerton Police Department in 2011. 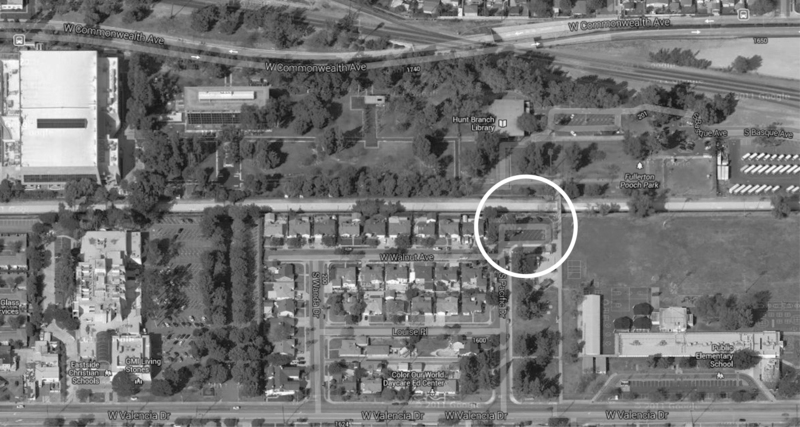 The Verona Slopes settlement, referred to as having been “lingering for decades,” was not actually filed until 2008, although the trail widening by the city that was alleged to have eventually resulted in the collapsing of the slopes below homes on Verona Dr. occurred in 1989. A city press release about the settlement outlines a somewhat convoluted deal whereby the city might possibly recover some of the $ 6 million payout from the slopes settlement, but if that has happened, it hasn’t stopped the city from having to fill a $ 7 million hole in the Liability Insurance Fund. The resolution will allow the sale of up to $ 7.75 million in bonds at an interest rate up to 6 %, issued over 20 year period. The debt service payments are expected to cost the General Fund $ 550,000 per year. Mistakes made in the present cost the taxpayers far into the future. How much more could we have done with an extra half million dollars per year for the next twenty years? Next time the city can’t afford something, let’s think about where this money went. The Fullerton City Council has voted to close the Hunt Branch library and begin the process of leasing the facility to Grace Ministries International for up to two years. The Council also accepted the Library Ad-Hoc Committee’s recommendation to explore ways to maximize the value of property on Bastanchury Road originally intended for a new library branch, and to sell the library’s bookmobile, already out of action for vehicular regulatory reasons. Two years ago public outcry over the possible closure of the Hunt Branch helped lead to the formation of the Library Ad Hoc Committee, whose report, presented to the City Council on June 4, acknowledged that the prior reduction of the Hunt’s open hours to just two days a week had made its operation as a library untenable. The emergency closure of the Hunt earlier this year initiated the effective abandonment of the facility as a site for providing access to books and other library services to the public. Although the preference of the Board of Trustees was to see the Hunt Branch adequately funded so it could resume its role as a full time branch library to serve Fullerton’s southwest residents, the Council, in a 3 to 1 vote (Mayor Whitaker dissenting, Council Member Sebourn absent), chose the fallback position of closing it entirely. They voted to authorize City Manager Joe Felz to commence formal negotiations with Grace Ministries to temporarily lease of the Hunt Branch, located adjacent to the church’s campus. The council also unanimously approved supporting an application by Fullerton Heritage to place the Hunt Branch building on the National Registry of Historic Places. The report also notes that “It is a beautiful and significant building in a once-beautiful location. The homeless encampment and the dog park have significantly diminished the area.” The dog park was built by the city itself, and the homeless camp, recently raided by police, has been allowed to exist. Such a camp would never have been tolerated on the front lawn of city hall. The report also contains the usual laments about the building’s supposedly remote location. Is it really so hard to find? In addition to the main parking lot reached by a long drive up Basque, past the school district offices, there is also a parking lot located just south of the Hunt, easily reached via Pacific Drive, just off Valencia, a major street (click illustration for larger view). And there is an elementary school next door. The report is full of carefully considered alternate options for the site, from a technology branch, to sharing it with a museum, but what is most troubling is that there was no clear plan in place for the Hunt Branch library’s future prior to closing it and turning it over to a church. We have no assurances that the building will ever be a library again.